I'm home on a Monday instead of at work because of ongoing political unrest in Haiti. This is day five of sheltering in place, which has provided lots of extra reading time. Book #12 of 2019 was Frederick Buechner's The Remarkable Ordinary: How to Stop, Look, and Listen to Life. "I think that a part of what to tell one's story in a religious sense means is to affirm that there is a plot to one's life. It's not just incident following incident without any particular direction or purpose, but things are happening in order to take you somewhere." Book #13 was Hold Tight, Don't Let Go, by Laura Rose Wagner. I reviewed this book at length here when I first read it. This time I read it aloud to my husband as part of our remembering, commemorating the ninth anniversary of the earthquake. We cried as we read this beautiful, horrifying, hopeful, despairing account of Magdalie's earthquake experience. A friend to whom I was talking about this book commented, "She's a blan, right?" (Blan literally means white, but it's used to refer to any foreigner.) Yes, she's a blan, but one who loves Haiti in all its complexity. She doesn't shy away from what's awful, but she's also affectionate and clearly cares about this beautiful place. "All I can do," concludes Magdalie, "is hold everyone in my heart, the only place I know where I can keep them safe." Book #14 isn't published yet; it was a second draft of a new novel by someone in my writing group. It was so fun! I wish I could hand you a copy! 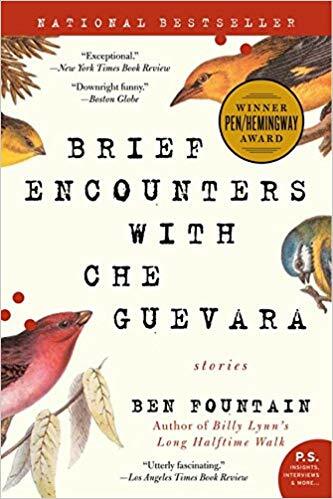 Book #15 was a book of short stories by Ben Fountain called Brief Encounters with Che Guevara. I have had this book for some time, but for some reason I had not read it yet. 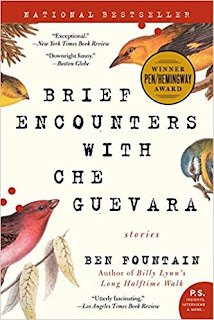 While sheltering in place I read it aloud to my husband and Ben Fountain became my new favorite writer. Blurbs at the beginning compare him to Graham Greene, Hunter S. Thompson, Evelyn Waugh, Katherine Anne Porter, Paul Theroux, Joseph Conrad, even Kafka. I definitely get all these comparisons, because these are characters in a complex moral universe where it's not easy to keep your hands clean, but Fountain is an original. Several of the stories are set in Haiti, one in Colombia, one in Sierra Leone, one in Myanmar, one in the US, and one in Europe. This book is so beautifully written, and the first and second stories are among the best short stories I've ever read. "Rêve Haitien" has the most amazing ending; it brought tears to my eyes when I first read it, and then after my husband and I discussed the story a while, he asked me to read the ending again. Again, it made me cry. I checked book #16 out of the library; it was Anne Lamott's Almost Everything. For a while I read everything Anne Lamott wrote, but I haven't read her last few books. This one had some gems in it, like Lamott's description of how reading got her through her childhood. I got to see Ben Fountain at our library this fall introducing his book Beautiful Country Burn Again. He didn't get a book published until he was in his forties, and he was a stay at home dad for all those years. I loved him. I'll check out this book for sure. I just checked again, he was 48!